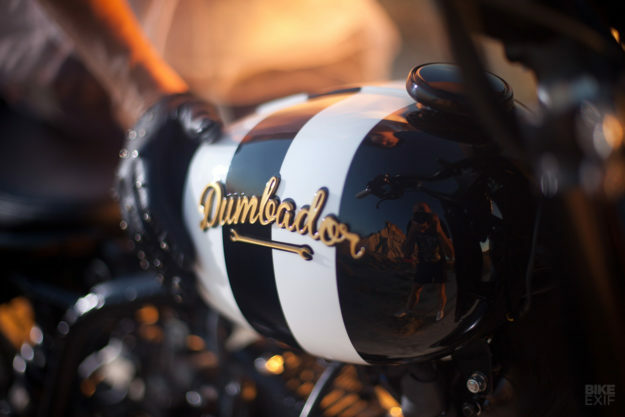 Dumbador is a small workshop based in San Sebastián, the Spanish city that sits on the Atlantic coastline of the Basque Country. And like a lot of the most interesting work these days, it’s from a part-time shop run by hobbyists who work full-time elsewhere during the day. 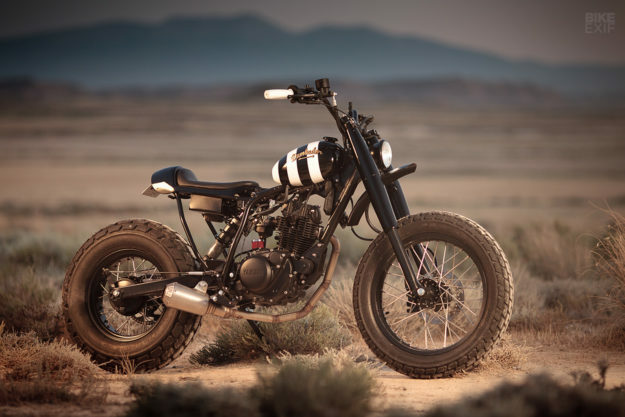 ‘Boo’ is a Yamaha TW, and we’re fans of that platform. 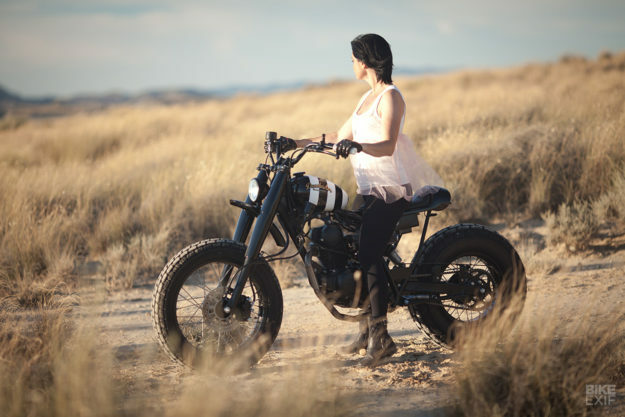 A recent quick spin on a friend’s TW125 revealed that the bike is far more fun than its diminutive size implies. 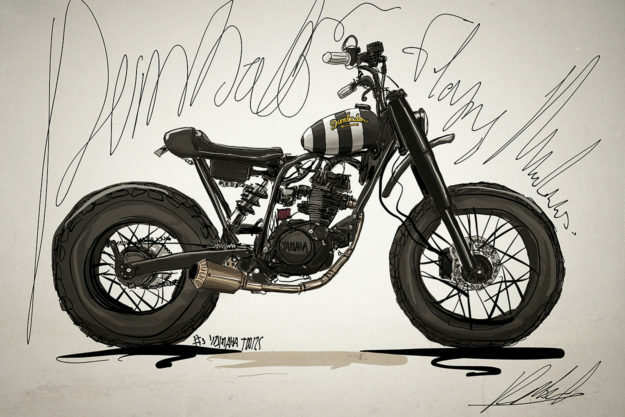 Perdinande got sketching—and he sure knows how to draw. Then with Inma and a mechanic friend, Oscar Irizar, he spent a year working on ‘Boo,’ going for a wide-wheel look with a narrow superstructure for maximum comfort. 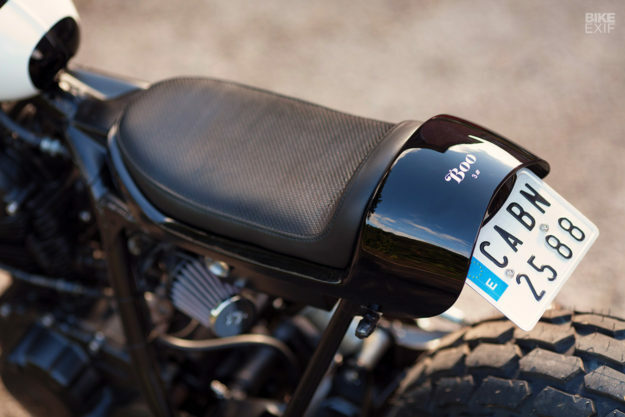 We love the peanut fuel tank, which is actually of Spanish origin: it’s been lifted off a 1959 Torrot moped, modified to sit neatly on the frame, and has two fuel taps. 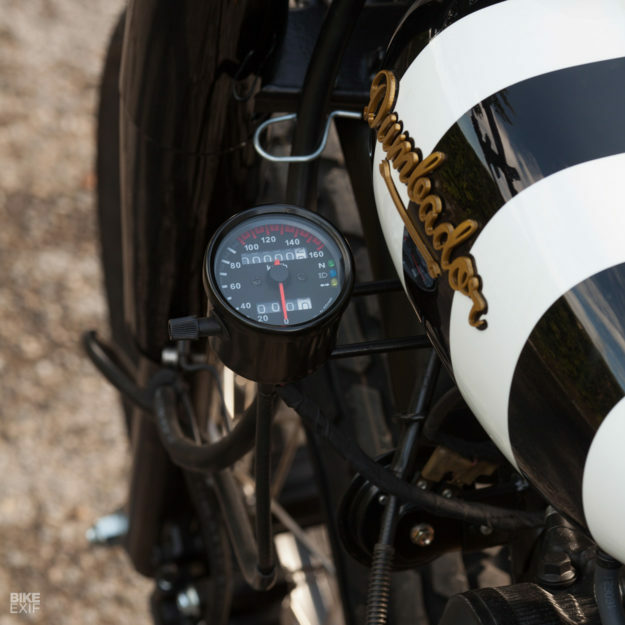 The Dumbador tank badge is a work of art in itself, laser-cut in stainless steel and lacquered in gold. 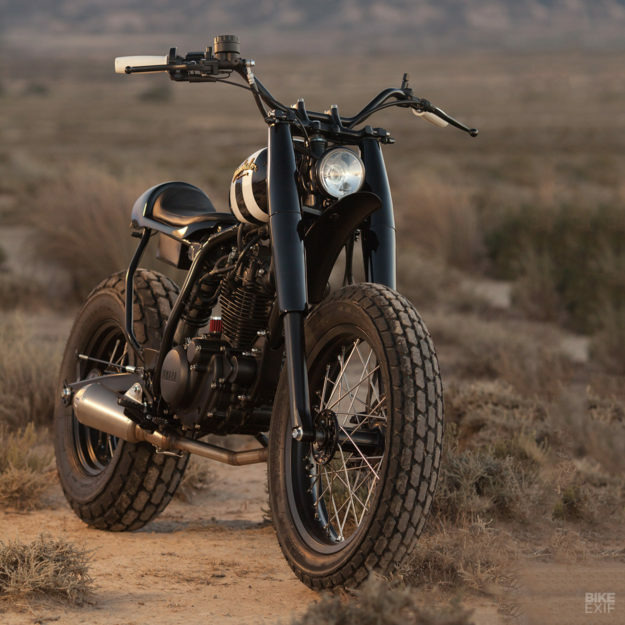 The bars are from a vintage Triumph T100, outfitted with controls from Gonelli and Posh. 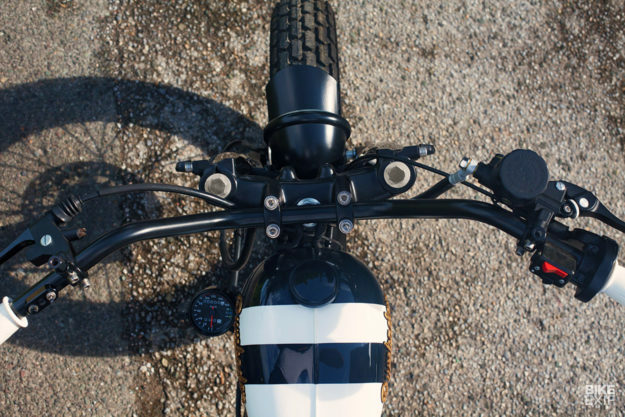 There’s a Bates headlight sitting ahead, just above a stubby, handmade aluminum fender, but you won’t find a speedo—it’s been moved to the left side of the tank to clean up the cockpit. Indeed, the whole of the bike looks clean. The stock seat unit, which is big enough for two despite the 196cc engine, has gone. In its place is a slimline affair with a pronounced bumstop tucked into a fiberglass cowl, sitting on top of a short, narrow subframe. The rest of the TW125 is speckled with little handmade parts, from the under-seat battery box (hiding a compact lithium-ion unit) to the chain cover. The smallest custom items are the lights, with tiny LEDs handling the blinking and stoplight duties. The engine was in good condition, so just got a minor refresh. 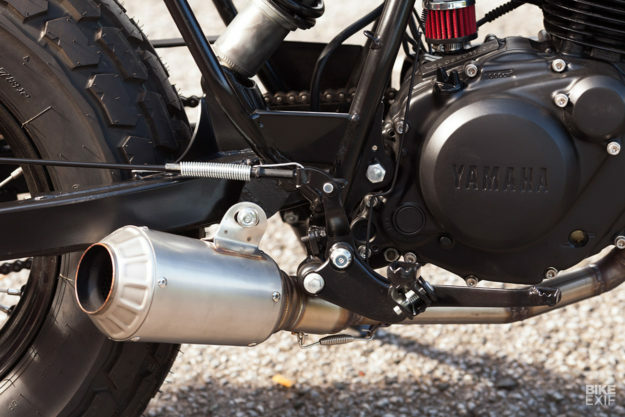 Dumbador have made a new stainless steel header though, and hooked it up to an aftermarket shorty muffler—which should be good for a small bump in decibels and horsepower. It’s the perfect little runabout for hardpack trails, and the streets of San Sebastián—which we know from experience are packed with traffic and teenagers on screaming mopeds. Nice work equipo—and enjoy your new ride, Inma.